I’ve come a long way since blotting five times a day. That’s an exaggeration, but if you have a problem with oily skin, you know the feeling. But I feel brave these days! 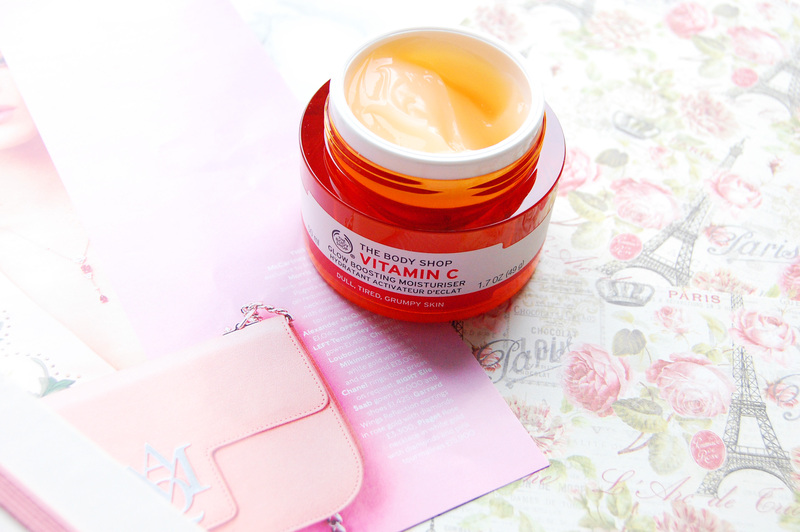 Since I got on so well with the Body Shop’s Vitamin C Glow Enhancer, I wanted to test the Vitamin C Glow Boosting Moisturiser, because I figured I could tackle both dewiness and hydration in one go. I’m also a sucker for citrus scented anything in the morning, and what could be bad with a potent dose of vitamin C? So on to the pros. The scent is so incredibly mouth-watering, and the moisturiser is very wet and non-greasy in texture, so it sinks in quickly. I love how it feels when I apply it, and it’s entirely weightless. As for the glow, it means what it says! My complexion looks even, brighter, and has an all-over healthy glow. I could blot in the afternoon, but I can get away with not doing so. The only negative aspect of this moisturiser is that it’s not especially hydrating overall. I can’t use it on its own or my skin will feel a bit tight, and my T-zone will go into overdrive, because I just need more hydration to keep things in check. What works for me is using toner and a solid hydrating moisturiser after a bit of this vitamin c moisturiser, and I tend to use two toners because I’m excessive like that. On weekends, which is when I mostly reach for this, I’ll tone and use the La Roche-Posay Effaclar Duo as first step beforehand, and it all works well. If you have normal skin though, I think this could work well for you. Of both the Body Shop’s Vitamin C Glow Enhancer and Glow Boosting Moisturiser though, I’d say the latter is best. The Enhancer is thicker in texture and can become flaky if you apply too much, or when blending foundation. The cream is easiest and faster to work with, and it’s surely a lot better for skin overall. Agreed! The feeling is so refreshing as well.